I just received my Canterbury KJV bible. It is fantastic!!!!!! For starters, the goatskin cover is amazing. I feels wonderful to touch. Like butter!! I can’t imagine what it will feel like after I’ve used it for a while. This bible is easy to read because of the larger type. I just love this bible more than any other bible I have ever owned, and I have a lot of bibles. I didn’t think any bible could be better than my Cambridge bibles, but this one is better. I even purchased a Bottega Veneta handbag to carry my bible in (small size with removable strap. It fits perfectly in the bag. This bag is far better than the fake plastic bible covers everyone sells, even Bob Seiman! Go to eBay to find a small handbag with a removable strap. You probably won’t find one for less than $200, which is more than I paid for the bible, but it’s worth it. If you want the best bible on the market, get the new Schuyler Canterbury. I hope that in the future Schuyler will make the Canterbury in other versions. I don’t like the way the Quentel has verses starting in the middle of a paragraph. I think they should start at the left side, just like all my other bibles. Thank you Schuyler for this beautiful bible!!!!!!!!!!! 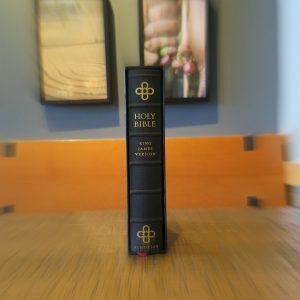 I have purchased many bibles from EVB, this is my first review. The Canterbury arrived yesterday (12/20/16), and it is beautiful! Black Goatskin. The workmanship is flawless. The red lining is that perfect red you have to see to believe, and the three red ribbons are a perfect compliment. The leather can be compared to a very fine pair of leather gloves…soft to the touch, great protection. The layout of the text, the feel of the paper, the lined pages in the back, could it get much better than this? I don’t see how. Thank you Schuyler, you can be proud. You got it all right. This KJV is the culmination of over 400 years of preservation, integrity, and craftsmanship. It is hands-down the best bible on the market today. I am going to purchase another one in calfskin brown. Thank you Schuyler! The Schuyler Canterbury KJV is a flawless Bible — For years I’ve used the Allan KJV 53 Longprimer, Black Highland Goatskin Bible as my primary bible with total satisfaction regarding its durable construction, perfect design and large font layout. However, as I age out I’ve looked for a comparable bible with larger more readable fonts. The Schuyler Canterbury KJV with 36 GSM Paper, Font: 11 pt. Milo font is much more readable. The bible is a bit bigger, but not too much. I love it….. I received this Bible a few days ago and have been doing the M’Cheyne 1 year reading plan in it since I received it. I wanted to live with it a bit before I reviewed it. What I like most about it is the print size, the line matching minimizing ghosting, and the overall quality of workmanship and material. Mark Bertrand is very partial to ‘limp’ text blocks and he will love this one I’ll wager. Hold it between forefinger and thumb at a corner and it sags. It is more compact in length and width than I expected. Somewhat weighty, but not overly so. Rather thick, but that was how they got that wonderful large print in this convenient package. I could, however, take this Bible to church with no problem. I had to get used to the goatskin cover. I love how gnarley the Highland goatskin on the Allen longprimer is. The goatskin on this copy is more akin to that on the Cambridge Clarion reference Bible. Not a bad thing, and the lines I like so much in the Allen are there, but not as pronounced. Perhaps it depends on the individual copy. Bottom line is, I would buy this all over again with pleasure knowing what I know now that I have it in hand. I have many high end bibles, including 7 Schuyler’s now, and this is hands down the best one yet. Schuyler hit a grand slam with this one. The cover is the softest goatskin I have. The font and font size is perfect. The darker guilding is beautiful. I love that psalms is single column. The drop caps are a great touch. This bible is a joy to read. I use the grant Horner reading plan and this is the perfect bible to use with that. This will no doubt be my daily reader from now on. My only complaint is I wish it had more notepaper . It has 11 pages. I wish it had 32 like a R.L. Allan. I hope Schuyler corrects this on future runs. Other than that this bible is perfect. I plan to pass it down to my nephew one day. I must admit, I have been following the development, waiting for the pre order, and finally tracking the shipment with the enthusiasm of a child waiting for Christmas. At the unwrapping I have not been disappointed. The binding of the Bible is superb. Jongbloed of course is synonymous with quality bindings. The hinge is much more relaxed than first generation Westminister bibles. The Bible out of the box will stay open to Genesis 1:1 and like other Jongbloed bibles I expect it to lay completely flat within a few days usage. The red leather liner and red ribbons are a beautiful combination. The art guilding, the gilt lines, and the goatskin cover with raised spine is all perfect. The font size and type is a dream come true for a high end KJV. This Bible will be able to fill an area previously held only by the Longprimer. The lack of center references, the single column Psalms along with the drop caps, provide for a beautiful reading experience. The print quality is dark and even throughout the text block. The paper has a slight cream tint, perfect line matching, and no reflective gloss. I am quite impressed with the back matter material in terms of layout and font type. The modern font and usage of red lettering makes the concordance very easy to use. The maps are very nice and come with an index. There is also a glossary of KJV archaic words, as well as some lined note paper. The front matter has a rather simple but elegant presentation page, the Epistle Dedicatory, and the Translators to the Reader. If your are a KJV reader or are buying for one, you will not be disappointed with this Bible. This is my first Schuyler Bible, & it did not disappoint me. The Bible is everything it claimed to be & more. The overall craftsmanship, the flexibility, quality leather, readability, & size. I also like the dark brown color I chose. I would have a hard time deciding which my overall favorite would be, but the Canterbury would probably win. I have to retract on my last review. I dont know if the weather changes durring shipping effected the bible when I first opened it or whatever it couldve been, but this bible is truly the best bible Ive had! The second of having it when I came home, I opened the bible to find that the hinge did not effect the bible anymore in a negetive way at all anymore. I also didnt mention in the first review about my pages curling. That has stopped as well. The bible is a good size for all uses and is flawlessly bound! The print is extremely readable. If I had one itty bitty complaint, it would be that the pages tend to shine more than my Longprimer 53’s. But all it takes is a little maneuvering to get the sheen out of the way. Great bible! Im still on the fence about whether this bible is better than Allans but either way its worth the purchase. This is an exceptional bible that is done in the same fine fashion as the Quentel Series with about the same dimensions as the Quentel Series bibles. The artistry of the red lined goatskin, red ribbons, red under gold art gilding, and the red used in chapter and verse headings and footnotes is simply beautiful, and are very befitting the time honored beauty of the KJB. The paper is quite opaque and it has an outstanding Smyth sewn binding. 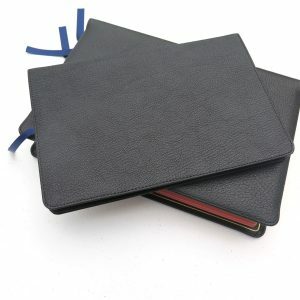 The goatskin cover is thick and textured, not as soft as Allan’s but obviously a very fine and durable leather cover. It has HOLY BIBLE, KING JAMES VERSION, and the Jerusalem Cross with SCHUYLER in gold printing on the spine, and an imprinted Jerusalem Cross on the front cover. The spine has very nice raised edges that reinforce and strengthen the bible. The cover is obviously made to last a lifetime. The bible opens flat, but not as flat as the Longprimer, although I believe it will once it is broken in a little. Three ribbons that are thick quality ribbons, as good if not better than the Longprimer. The red under gold gilding is very well done, and is neatly edged, and in my opinion, it is much better than any of Allan’s or Cambridge’s gilding. The bible opens and closes with a few blank pages of thicker cardstock type paper including a simple presentation page in the opening that is very well done. The 36gsm paper, used throughout the bible, begins with a title page and a very nice table of contents that will be useful to those unfamiliar with the books of the bible. It also includes the full Epistle Dedicatory and the Translators to the Reader found in the 1611 version, very nice and informative for those who have never read it. Each Testament is divided with a single page at the front. Each book of the Bible begins with a new page, and although this takes a little space, it is very tasteful, and great for helping one find the opening chapter of each book. Each page is laid out in double column text, with about a half inch margin on each side which is excellent for reading. All references are marked at the bottom of the page by chapter and verse, and are identified by lower case alphabetical italicized letters within the text. The text is matched perfectly on both sides of the page which reduces ghosting. The font size makes it very easy to read, although it is not as dark as Allan’s Longprimer. The text is standard 1611 KJV and includes italicized words that are not found in the original Hebrew and Greek but are needed for English translation, as well as pronunciation punctuation marks and divisions for proper names. The book titles are very nicely done making it easy to find the front of each book. Each chapter is opened with an artistic traditional KJB large art red letter, very beautiful and tasteful. Major sections of the text are identified with traditional headings that are very simple, large enough to read, and very useful for those who are unfamiliar with the themes of these sections of text. Each page is numbered at top inside throughout the bible. The running numbers are from 1 – 1693 includes Old and New Testaments, the King’s English Glossary, and the Concordance. On the upper outer corners of each page there is a reference of the book and chapters included which is very useful for quickly finding any chapter and verse within the bible. The bible includes a glossary of terms used in the KJB which is very useful for those not familiar with the King’s English of the early 1600’s. It also includes a beautifully organized concordance that would be perfect except for the small font used. The font in the concordance is way too small, and although it is crisp and clear, a couple of sizes larger would be greatly appreciated for those of us with tired eyes. The bible includes a few lined pages in the back, not as many as some as the Allan NASB or ESV, but enough for notes. The lined pages are not an afterthought like many I have seen in Allan’s bibles, but the same quality paper is used throughout. The colored maps and charts in the back are the finest quality maps and charts that I have seen in any quality bible, and include a very nice index to the maps in the back. Overall, I am very pleased with this bible. Improvements for future editions should be a larger font for the concordance, or simply leave it out, and a slightly darker print. Note takers might have more to say about the margins but the beauty of this edition almost demands that you do not clutter it up with notes. This is a reader’s bible that is simply too beautiful to mark up. That being said, a wide margin version might be appealing to those avid note takers who simply cannot resist writing in their bibles. I can definitely recommend this bible to those who love the KJB. It is a tastefully done work of art that must be seen to be appreciated. As mentioned earlier, it is about the same dimensions as the Quentel Series, which is larger and heavier than a hand size bible. It is also larger and heavier than Allan’s Longprimer Series as well, and there is no doubt that KJB readers will compare these two fine versions. In fact, if you are looking for a good quality hand size KJB, I recommend the Allan Buttero Calfskin 52 Longprimer; although not as beautiful as this bible, it is much smaller, tastefully done, and very readable, and it comes with thumb indexed version if you like. If the larger size is not a big deal for you, this is the highest quality KJB available anywhere. At the opening price, this is a great deal for KJB lovers, and it would make a great gift for someone special to you. Finally, I have tried to give an honest review that highlights the strengths and weaknesses of this version. This is definitely a 5 star bible. Thanks Schuyler. Received my Canterbury 4 days earlier than expected!!! THANKS evangelicalbible for working so hard to get these out to customers ASAP!!! This is an absolutely beautiful Bible! The soft goatskin is lovely to see and hold. The large type is great for reading. Have been using my LP53 as my reader, but may change to the Canterbury cause the type/layout are so very readable. The red liner, red ribbons, and limited red type add just the right amount of color. May end up ordering one in calfskin to use as a carry-around reader. Great job Schuyler!!!! Schuyler deserves high praise for this Bible. Outside of a museum, I have never seen a copy this beautiful. Craftsmanship in all sorts of worthwhile endeavors seems to be becoming rarer and rarer. Schuyler/Jongbloed’s craftsmanship in this particular endeavor will surely have the effect of helping people like me (half-spirit,half-animal “amphibians” that we are) to have our hearts and minds opened to the word of God. Before I received this bible I was a major antagonist during its publication. I was afraid the bible would be a “designed by committee” effort and would fail by trying to please everyone. I was against the self-pronouncing text, the double-column verse formatting, the bible’s size, and the embossed cross design on the front cover. I own a single-column Cambridge Clarion KJV (paragraph style) and thought its design was essentially perfect and un-improvable. I was unsure why Schuyler felt the need to print a new series of high-end KJV bibles in a market already crowded by Cambridge and Allan. I actually sent a few detailed emails to EvangelicalBible and Schuyler enumerating and elaborating on my above concerns and I more or less dreaded and regretted my pre-purchase up until the moment I received the box, opened it up, and beheld the bible inside. Boy, was I wrong about literally *everything* listed above. Each of the things I presumed I would most dislike about the bible turned out to be its chief features. This bible is beautiful; the goatskin is luscious–almost like a soft pillow–and sufficiently limp to hold “bible yoga” poses; and the ornamental drop caps add a refreshing break for the reader’s eyes. The bible font is larger than I expected and this larger type has already become one of my favorite features. It’s simply easier to read than smaller font. I am impressed they managed to enlarge the font without increasing the thickness of the text block. Speaking of the text block, it’s gilt with red offset and includes four beautiful velvet-red ribbons. The paper is thicker than most “India paper” bibles but its still very thin. This is a major feature that beats the Cambridge Clarion into the dust because the Clarion paper has a tendency to curl a bit. This Schuyler bible paper is thick enough to prevent curling but thin enough to maintain the overall limpness and fineness of the bible. Since the text is aligned on each side of a single leaf, there’s no ghosting. I love it. I’ve come full circle on this bible. For the past 12 months I’ve been afraid Schuyler was about to make a huge mistake and now I can’t stop singing the praises of this magnificent KJV. I own several bibles and this Canterbury KJV is easily the best bible in my library. I never should have doubted Schuyler’s judgment! TL;DR: Buy this bible. It’s the best-in-class non-study KJV in existence, imho, of course. Good luck. I forgot to mention how much I love the embossed cover. I keep finding my eyes glancing at it. Also, I forgot to mention that the cover lip extends *just* far enough beyond the diameter of the text block so that its pages never catch on the seam of the goatskin cover. It’s not extended far enough that the cover sags over the edge, which I like. Aesthetically the bible is near-perfect. Also, to correct a small error, I wrote that the guilt is red offset but it is actually salmon-colored. Finally, I forgot to mention this bible has some of the most beautifully illustrated maps of any bible I own. It also has a good glossary of names and places. The ribbed spine (something I was worried about) is actually a nice touch that has the added bonus of making the bible easier to hold with one hand. I received the Canterbury KJV Black Goatskin a few days before Christmas. After opening the shipping box and custom storage box, I carefully removed the horizontal and vertical wrapping paper. At first glance, I was…….astonished…and initially at a loss for appropriate adjectives to adequately convey an honorable description to family and friends of the masterpiece I was holding in my hands. However, it only took a few moments for the descriptive words to come forth…….majestic…..opulent…..regal. I have other fine versions and translations of the Holy Scriptures…Cambridge KJV Turquoise Reference, Schuyler KJV Classic Reference ( First Edition in Antique Mahogany Brown – which is different than the Brown Marble in the Second Edition and the Quentel and Canterbury Dark Brown ). The Allan and Cambridge bibles are nice and have some satisfactory features. That said, Schuyler has now set the bar very high with the production of the Canterbury KJV….. and the Quentel line for the other translations. IMHO, The Schuyler Canterbury KJV is unique and displays the art, craftsmanship, and workmanship of the best premium bible available in the market today. I ordered a Canterbury KJV Dark Brown earlier today…and plan to order a copy in Dark Purple soon. Thank you Schuyler…..for being good and faithful servants in providing this elegant and exquisite copy of God’s Word! For many Years I have loved to read the Word of God but only made small investment in getting a quality Bible. Most of the other ones were nice starter quality’s. Most only had 8 sized font and fell apart easily and the pages would shred on me. I figured that I would buy an expensive machine like a snow blower for 10 uses or less in the winter time of Minnesota so I thought why not do the same for the KJV Bible which is to be read every day and handled readily in soul winning. I love this Schuyler Bible because it is the authentic words of the KJV and uses only verse references to show definite meaning and does not use a commentary other than the Bible verses themselves and provides the beginning letter to King James, and the translators to the reader providing an inspiring note for why the KJV was made. This Bible has a nice font size, not to big but big enough to where for the most part no glasses are necessary. The Calf skin is great quality and feels good on the hands, and the decoration letter at the beginning at the start of every chapter adds natural appeal to the eyes along with the red numbering so that the words don’t strain as much on the eyes. All in all this is a great Bible to buy for anyone and is at a pretty reasonable price, especially because the paper and materials add major quality and one can really appreciate the Word of God even more than they already have. We all know black words on a white page are sufficient for the Bible, and if one plans to use it everyday, I would definitely recommend it! I would love to give more stars because this is a beautiful bible but it arrived in damaged condition. There was a ding on the top gilt and top inside back cover that had to have been done during production before they packaged it in the box. No damage was on the box. You would think that for the price of this bible they would inspect them carefully before packing and shipping. This is not our first purchase and we have always been happy before. We have returned this bible for a replacement and hopefully can come back with an update to this review to add two more stars dependent upon how they handle this return. This is easily the most wonderful Bible that I have ever had the privilege of reading. While the majesty of scripture comes solely from the creator who inspired its writing, this Bible does an excellent job of reminding us that the scripture is truly worthy of praise. This Bible is flawless! No bleed through, perfectly gilded pages and a binding which will last for generations. Worth every penny! Out of over 200 bibles from over 40 years of ministry, the Canterbury KJV is the best by far. The readability of the text is amazing. The feel of the goatskin cover is great to hold while preaching or teaching. I was so gratified to get it by Christmas. Your staff is amazing. Thanks. I could not be more pleased with my new bible. I highly recommend it. You will not be disappointed. Received my much awaited copy today. If there is such a thing as a “perfect Bible,” this has to be it. All that I’ve wished for in a Bible is in this package: the Schuyler KJV Canterbury. I’d give it full marks for print legibility, paper quality, and overall design and layout. The attention given to details has been incredible. Schuyler certainly deserves the accolades it is receiving for producing this outstanding Bible, and EvangelicalBible.com for the excellent customer service. I would recommend that this Holy Bible be used for home or study and not used for travel as at least one review above mentioned. The size is perfect for study, not regular travel. With that said, the cover is simply amazing because the goatskin leather is super soft. Granted, that probably makes it difficult or impossible to imprint, but I would never allow heat on such beautiful leather. Besides, it is hard to improve on the deeply embossed Jerusalem Cross on the front cover. It opens nicely the first time you open it; no break-in required. Presentation page is great, as I bought mine for a gift to my son. The font is nicely done, making this Holy Bible very readable. While I and my church don’t view it as canonical, I wish the Apocrypha, which was part of the original King James Version, was at least an option. With that said, this Holy Bible is a lifetime purchase, as it should last a lifetime with modest care. I would recommend it to anyone wanting a high quality Holy Bible. Let me preface this review by saying…out of all the high end bibles I’ve ever purchased…this is the ONLY one I’ve EVER written a review for. From my perspective; that says A LOT. This is only my third Schuyler bible. I’ve owned over 30 Allan’s over the years. When they first came out a few years back, I bought a first edition Quentel NASB in imperial blue. Honestly, I wasn’t impressed. If you were…great. But I wasn’t. I ended up flipping it on eBay for a fraction of the price. 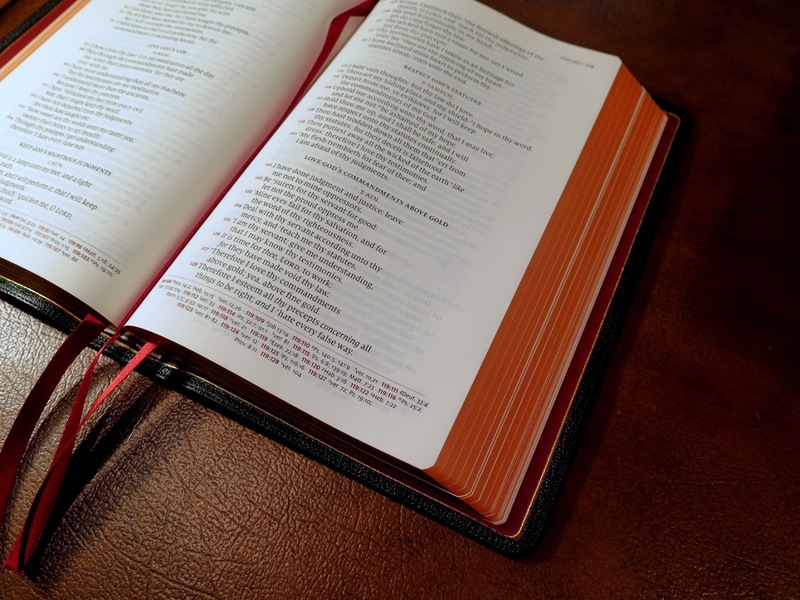 It wasn’t a bad bible per se…it just so happened that what it did well and excelled at, wasn’t something that was of immense importance to me when doling out over 200.00 for a bible. Like most things in life; food, music, entertainment, etc…the esthetics of high end bibles are very subjective and varies from person to person. One man’s dream is another man’s eye roll (and vise versa). After my experience with the Quentel, I’ll be honest: I have somewhat ignored Schuyler. I’ve mostly been focussed on Allan’s, rebinds and Crossway’s. But since taking a liking to the NLT I decided to get a Caxton in green goatskin. I was quite impressed. It is BY FAR the best binding and paper you will find for an NLT. In my opinion, it’s far superior to the Quentel. With the above history set in place, let me just say…it takes A LOT to impress me when it comes to high end bibles. After having owned over 40-50 the last 4 years or so, I think I’ve blown out my dopamine levels. You know “that feeling” you get when you first open the box and you see those puckered corners bulging from the paper wrapping? Yeah, THAT feeling. To see it there bidding you to unwrap it and at long last smell of its leathery perfection as the watery binding droops in your hand. There’s just nothing like it. (Hello, my name is Steve and I’m a high end bible-aholic). Whether we realize it or not, I think some of us get addicted to high end bibles because of “that feeling”. Yes, I know; we also like to see the Word of the Living God commemorated and bound in a most fitting, elegant and vibrant way. I agree with that and share those feelings as well. Believe me, the thought of a paperback bible causes me to have to repent of Pharisitical thoughts. But if we’re honest with ourselves, once “that feeling” goes away…so often we end up selling a bible that at one time felt as if the tangible presence of God came wrapped within a yapp. (You know who you are). Or perhaps it’s just me…but I doubt it. Anyhow, I got off track. Back to “it takes a lot to impress me”. Having just unwrapped the Canterbury in black red lined goatskin…let me say…I’m beyond impressed. Honestly, it felt as if I had just opened my first Allan. I kid you not. When the Canterbury won the bible of the year in the poll that Luis started, I thought: “Yeah, the only reason it “won” was because it JUST came out and people still haven’t come down from the dopamine overload of “that feeling”. But, nevertheless, I quietly placed an order for one and thought “lets see for myself”. In regard to my head wagging theory of “it won because it JUST came out”…yeah, I was wrong. Not that it didn’t produce “that feeling” because it most assuredly did. But Schuyler hit the nail on the head in EVERY aspect. The binding, paper, art headers, raised hubs and just the overall majestic beauty that the Word of God truly deserves. Pictures truly do this bible NO justice. I know you’ve heard that before…but I REALLY mean it. It must be held and seen with your very own eyes to truly experience the work of art that it is. I have never, and I mean NEVER felt such a buttery goatskin binding in all of my life. This thing just saggs…(it’s truly the “thug” of the bible world. Cuz it be saggin’ like nobodies bizniss). It has just enough yapp to produce that elegant “pucker effect” in the top and bottom left hand corners. The quality of the paper is unbelievable and jaw dropping. Honestly, even for me, it was jarring to say the least. Do you know how good the paper on the 2016 Allan NCR’s were? This blows the NCR’s clean out of the water. Seriously. It’s like SILK. And the red on the ribbons and binding? It’s SO red. Pictures do it no justice. The contrast between the black and red is alarming. Simply gorgeous! If this Bible came out in June…it would’ve still won. I mean it. I am writing in this Bible and addressing it to myself in the presentation section as soon as I can. Why? To ensure I don’t sell it if “that feeling” goes away and the allure of a sale/trade doesn’t bewitch me into a state of ludicrous-idiocrisy that I’ll soon regret. Can I get a witness???? You know who you are (I’ve probably sold, bought or traded with you). I’ve only written in 2 other bibles to serve as an insurance policy that I wouldn’t convince myself to trade or sell while in the pursuit of yet another bible (to produce “that feeling”. Those bibles are (1) the 2016 NCR and (2) Allan’s NASB Reader in blue. I can now say that the Canterbury goatskin bible has officially become the third. Howbeit, I hardly think “that feeling” will go away. So perhaps it’s not necessary to write in it? Perhaps its beauty alone is enough to prevent me from being a total weeny? Honestly, I think it is. But, nevertheless, I don’t trust myself. Since my dopamine levels are severely low, I must obligate myself with a micron pen. Do yourself a favor and pick up a Canterbury. If you’re a bible addict like me and you’re jonesing for “that feeling”, the Canterbury will most assuredly provide it. Not to mention, it’s a stunning tribute to the timeless splendor of God’s Holy Word. Now, you must excuse me; I’m gonna go look at it and see if I can get a buzz. May the Lord bless you all in the coming year. I honestly don’t think I can add anything to the wonderful things that have been said in the previous reviews! Overall it is probably the best KJV Bible on the market! Wouldn’t it be nice to have a wide margin Canterbury (with maybe a 9.5 – 10 pt bold font)? Hint, hint, hint! This is an update to my previous 3 star review. Thankfully, I am happy to be able to give five stars and report to you all that this company does care about their customers and will make things right if you have a legitimate complaint. The customer service handling this return was outstanding and they sent a replacement that was in perfect condition and carefully packaged in surprisingly fast turn around time. We are very happy now and will buy from this company again. As an owner of many quality bibles, from Cambridge, Allan, and Schuyler, this is the best KJV I have ever owned. The quality is superb. Feels great in your hands. Font size is great. If you had to pick one KJV, pick this one. It would be great if they made this in wide-margin. Also, would willingly give up concordance for a smaller size Bible. My Schuyler Canterbury edition arrived December 22nd just in time to preach the Christmas Day message! I purchased the black goatskin edition. The craftsmanship is absolutely beautiful. The page layout is tasteful and honors the heritage of this translation. It is well deserved like the honor and respect due to a faithful elder. The font size perfect for preaching (and Lord willing) will allow for us to grow old together. Without a doubt this will last a lifetime. I love the section headings as they are helpful. This is the chancellor of my collection and was granted pulpit tenure twice a week. I highly recommend this edition to anyone who reveres the King James Version of God’s word. This is the first Schuyler Bible I have ever purchased and all of you have done a fabulous job. You should be proud of yourselves. I just received my Schuyler Canterbury Bible. AMAZING, the quality of this Bible is absolutely outstanding. I had high, high expectations the whole time I was waiting on the shipment and when I opened the box and removed the Bible all my expectations were met. The Goatskin is super soft and beautiful and the page quality is unlike anything I’ve ever seen. I am beyond pleased and I have nothing negative to say. I presume this Bible will last this preacher a long time! I already added a review, but would just like to add that this Bible is a perfect size, smaller than the NKJV, NASB and ESV put put by Schuyler and hope all the reg size Bibles they make from here on out are the same size, its really a perfect size, not too big and not too small. Thanks Evangelical.com and Schuyler. Schuyler took a 400 year old piece of literary art & made it an phenomenal heirloom to be past on someday. All the exceptional Schuyler qualities with an excellent book block, beautifully appointed, with the most wonderful font & all brought together to bring focus to that wonderful drop cap letters. I just received my Canterbury KJV Bible today. 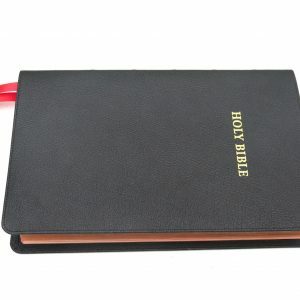 I had a few concerns upon ordering this Bible, such as the flexibility of goatskin versus stiffness of calfskin, and the color black versus some other choice. As it turns out I am well pleased with the goatskin and don’t find it too flexible and the black color looks better in real life than in the pictures. I am extremely pleased with the references located at the bottom of the page allowing for a much larger font in the actual scripture’s text. Being older and having poor eyesight the larger font is great. Overall it is a beautiful Bible with the Jerusalem Cross embossed on the front cover and the gold lettering on the spine with gold over red on the edges. The artistic red capitals for each chapter give this Bible a nice old world charm and I feel the descriptive headings throughout the text are helpful and not obtrusive. The Bible helps in the back of the Bible, including maps, were all tastefully done. Though I have read the King James Version for most of my life I still feel the King’s English section will be helpful. Regarding delivery, I currently live in Asia and received this Bible, as well as two other Bibles I ordered from Evangelicalbible.com, within a week. I have given this Bible a five star rating. An impressive Bible and with Evangelicalbible.com’s service I would heartily recommend this Bible to anyone. I ordered my Schuyler Canterbury Black Goatskin Bible on September 13, 2017. It arrived at my home within three days (thank you evangelicalbible.com, especially Karen for your excellent service). I don’t want to bore you and re-hash all the points of the previous reviews. I would say: what they said! I do want to briefly comment on why this is a wonderful edition of the KJV for me. I want to start with the 11 point Milo font that the text is printed with. I need to use reading glasses, not by choice, but by necessity. All of my other Bibles had much smaller fonts. However, even with reading glasses, I struggled to read the text. I have no difficulties with the 11 point font. Also, the color of the paper, a light cream color was a pleasant surprise. I had hoped it was going to be a bright white paper. Now I am glad that it was not. It is so easy on the eyes when you read a number of chapters at a sitting. I can’t say enough about the Goatskin, it is very soft, subtle and luxurious to the touch. If you love the KJV of the Bible please give the Canterbury from Schulyer a try. I selected the Goatskin. But I am sure that if you select the Calfskin you will be just as pleased as I am! I would like to update my review if the Canterbury KJV from Schuyler. I have been reading the black goatskin since September. Recently I broke down and purchased the Dark Forest Green Calfskin Canterbury KJV edition, just two weeks ago. Both are lovely. Goatskin is so very supple. The Calfskin is soft but not as suplple. I am a minister. Both covers would be excellent for preaching, same block. It’s just a matter of personal preference. You cannot go wrong with either choice. If you are a fan of the KJV the Canterbury is the best reading version that I have found. I also, would like KJV fans to give consideration to the Schuyler Classic KJV. It is a wonderful alternative. It is based upon the Trinitarian Bible Society Westminster edition. The same excellent qualities that are in the Canterbury are present in the Classic but in a different forum. Whereas the Canterbury has 11 pont font, the Classic has 9.6. I can read both with my presbyopia. The 11 pont font is a easier read. Yet the Classic is a great read as well. The Canterbury presents the Psalms as poetry in a single column, the Classic keeps to the more time honored tradition of keeping to the two columns. The Classic has some intriguing features, 200,000 cross references placed at the outside margins, not in a center column, I like that feature. Also, those troublesome words we struggle with are explained at the outside margins as well. The use of pronouns is given an explanation at the front of the Bible. This is very helpful. These are two different approaches to the KJV. I highly recommend both of them for your consideration. 10/10. This bible, from both a material and a spiritual standpoint, is as close to perfect as you’re going to get in this present age- period. I say “almost” because I can only find one, maybe two, minor faults with this bible (that I will get to last). And if you’re wondering how it compares with other bibles in the world today, let alone in it’s class – it has no equal, and it’s nearest “rival” isn’t even close. The most important reason why this is the best bible on the market today, is because this bible actually contains THE English written Word of God: the Authorized Version, also known as, the King James Version in the pure Cambridge Edition. I know what you’re thinking – but don’t worry, I will not preach “KJVOnlyism” here. But I will have to point out that, since this is a review about the rating of a bible, the main quality of which I must evaluate any bible is the quality of translation, truthfulness and accuracy to the original Hebrew/Greek manuscripts. Now despite popular opinion and the general consensus is among these brilliant scholars we’ve had through the years, the Schuyler Canterbury achieves perfection in this category by publishing this bible via the Authorized Version (pure text of the Cambridge Edition). Bravo Schuyler. *Just a quick word of advice for any believers reading this that may be in need of some guidance regarding translation matters: go to God and pray about this and try to discern what God thinks about the different bible translations before you go seeking your favorite pastor or favorite theologian’s opinion. Do this before delving into the internet research you will undoubtedly do. The arguments that will come your way will sound very intelligent and may seem overwhelmingly convincing, and the endorsements of one side over the other by popular religious leaders may seem overwhelming. Proof-test these arguments for the truth, using the Truth (1 Thessalonians 5:21), and search the scriptures daily to see if what you’re hearing checks out (Acts 17:11). You’ll need His guidance if you are to discern the truth about bible “translations” in this world of smooth talking scholars that may very well be smarter than you and I. But just because they are intelligent and educated doesn’t mean they are leading you to truth or know what they are talking about (1 Corinthians 1:27) – so stay in the Spirit on this issue and hold fast. And don’t worry either way, if you are truly one of His, you will eventually come out of this knowing the truth – though the sooner the better, for your sake. The next reason why this is the best bible on the market today, is because of the simply superior craftsmanship and material here. If we ignore the translation itself, one cannot deny that all three of the top premium bible publishers, Schuyler, Cambridge and Allan, produce some exquisitely crafted bibles. However, when it comes to material quality and premium details, Schuyler reigns supreme (taking the crown from Allan). The Canterbury is is their finest example of such. The Canterbury goatskin leather, is the 2nd highest quality goatskin you can possibly buy (with the famed highland goatskin from Allan barely edging out the Canterbury to remain in 1st place as far as goatskin leathers go). It is plush, soft, sturdy, grainy, unique, natural and beautiful. I would say it is an enlarged but exact replica of the goatskin featured on the Cambridge Clarion, but the Canterbury leather beats the Clarion leather by featuring a fully leather interior liner, no polyurethane, and a striking gold trim around the entire edge of the inner cover, while featuring the same superb outside stitching and feel. The art gilding is top of the line, as it is on thick, boldly, neat and tasteful. On par with Allan, albeit with a slightly different color and slightly better than Cambridge’s art gilding which is just perhaps a bit too light. The bible opens up flat in Genesis and in Revelations – it better for this price. I’ve never concerned myself with seeking high-quality bible ribbons, I really don’t care too much about ribbon quality as long as they work. But I have to admit, out of all the bible ribbons I’ve ever seen, the three that come with the Canterbury are noticeably better than anything else I’ve seen or own. Almost looks custom made. They are weighty, thick and scream quality. The paper is nice and thick too, 36 GSM and creamy yet opaque. The font is one of its strongest features as it sports an 11 point font and is extremely readable. The size of the bible is large – this is not a hand-sized bible but it is not unmanageably large because of the remarkably thin profile of the bible (relative to the length and width). I was expecting a behemoth of a bible but was surprised by how portable it could be if I wanted to travel with it. Now while you could take it with you everywhere you pleased, the size demands that it be perhaps your main stay-at-home bible, but this will depend on your own special needs and preferences. If you want a more balanced blend of the Canterbury features with a portable size/weight then you might consider the Schuyler Classic (Westminster) KJV Bible or the Cambridge Concord KJV – These are both noticeably smaller and more portable bibles that have many top quality characteristics as well. Now I know this may appear to be subjective, and one could argue such, but the two column verse-by-verse format featured here is the best service you can do yourself in terms of choosing the format of your bible. While the world races to embrace the single column, paragraph-styled formats, the Canterbury defiantly remains verse-by-verse and double column (Song books are single column but still verse-by-verse). However, it does so in such a way as to virtually eliminate distractions from the text. Cross references are neatly bunched at the bottom, leaving a visually arresting and almost breathtaking expanse of scripture, nearly scripture alone, in your face – with only the occasional subject headings and soft-red verse number to further remind you that you are reading a bible. Besides making a couple argument points in defense of the verse-by-verse over the paragraph format, I won’t go into the pros & cons of verse-by-verse double column here, because I could take up a whole book arguing in defense of the old verse-by-verse. But I will say that if you have any inclination to think, that it might be plausible, that God Himself might actually have anointed the 1611 KJV bible to be THE version of the written Word for the English speaking people in 1611, and the English speaking people today, then do yourself a favor and Google images of the text format of the 1st editions of the 1611 KJV bible and behold the format that God was pleased to use in order to help His people study, meditate and memorize the scriptures for roughly 400 years. The format, style and even the stylistic drop-caps are breathtakingly similar to the 1st Authorized/King James Bibles ever made. Could there have been a reason for this that is spiritual and Godly, and that is not simply logical/scholarly/psychological/traditional, as to why these men used unapologetically, in-your-face, verse-by-verse formatting in 1611? Don’t get me wrong, I get it. I actually prefer the single-column paragraph-style format myself and it was very hard to give up my lovely Cambridge Clarion when I switched back to verse-by-verse. But I have since been convicted that the way God intends for me to study and meditate on His Word – is through verse-by-verse format just like He moved the thousands of Christians before me to do. I know I sound crazy. And I’m not going to try and defend this reasoning here today. But I will say that the easier ability to memorize His words and the ability to meditate on scripture via bite-sized-chunks (verse-by-verse), is not something to dismiss but something to appreciate. Countless times I’ll see people in the elevator with their phones to their face, scrolling speedily through their Instagram feeds and Facebook feeds, flying past post after post, liking pictures and liking comments on the way, so very quickly, barely digesting anything they see for longer than a second. I can’t help but think, there are those that would like the bible experience to be just the same ya’know? While we may prefer to speed-read through the bible with, an allegedly, more accessible paragraph-format bible and “get lost” in the scriptures, as some have argued, to retain better context they say, it would be best to recognize that perhaps our own pride is leading us to believe that we are smarter than we think we are. Or that we don’t need the helps that verse-by-verse format provides our minds subconsciously. Or that we don’t need the Holy Spirit to guide us into all truth – incorrectly thinking that perhaps we can decipher with clever theology the things of God or perhaps we could employ fresh, new, hip reading formats in order to know God better. Look, I don’t know why they chose to use verse-by-verse formatting when they published the 1st editions of the Authorized King James Bible (scholars would argue that it was simply tradition and the KJV borrowed from earlier folks – I doubt that is the primary reason, but if that’s true, then fine: give me the same tradition that was good enough for Martin Luther and Charles Spurgeon and Martyn Lloyd-Jones and the other thousands of men and women who were after God’s heart). Nor do I know why God continued to choose to use verse-by-verse format bibles to reveal Himself to the masses and to uphold roughly 400 years of faithful Christians. But maybe, just maybe, could it be that by breaking down scripture into verse-by-verse formats, our puny brains that could never even begin to comprehend the bible, the scriptures and the things of God without the Holy Spirit there to guide us – just maybe this verse-by-verse format could serve to benefit our limited abilities to comprehend such weighty thruths that are not of this world? Maybe to actually encourage us to slow down, to wonder about the Word we’ve just been given, and to give us a greater opportunity to meditate on each and every word? Verse-by-verse helps us do just that… Time for Him to speak to us in between the lines? To perhaps take time to reflect? To repent? But I digress. I absolutely adore the very handsome and aesthetically pleasing blind stamped Jerusalem cross on the front of Schuyler’s bibles. It’s very cool, I must admit. Yet, I have to at least disagree with it being featured so prominently on the front cover of the bible, and at most: contest it’s selection as the symbol/brand for Schuyler. This symbol has a rich history, it is true, but that rich history at least causes one to ponder whether we want to embrace a symbol that, some would say, represent war, violence and destruction. Now I don’t necessarily agree with this negative point of view, because I see no reason to doubt the motive behind the claim of the symbols’ creators: that this symbol represents Christ. However, I do see how other people could attribute the symbol to something else – an unnecessary battle to fight, so to speak. How about embrace no symbol at all and leave the cover either blank (my preference) or simply say Holy Bible? That’s it. But hey, after much research, study and prayer, I eventually decided that nothing has moved me to take any strong objection or position on the history of this symbol. It could be that I simply don’t know enough about it yet, but I’m pretty sure I’ll be comfortable with seeing this logo on a daily basis and could live with it being stamped right there on my bible. But hey if I could change any little thing about this magnificent bible – it would probably be this. Now in the spirit of keeping with the same train of thought, I expressed reasons for seeking to imitate some of the text format of the 1st printed edition of the KJV and I commended the Canterbury for doing just that. Which is why I am almost equally as puzzled as to why the designers chose to omit the translator footnoes. The translator footnotes are not some modern invention or trend to shy away from, but instead, an inherently basic component of the 1st editions of the KJV bible – not to mention a basic component of almost every produced bible in the world today… While I suppose omitting the footnotes do help increase the Canterbury’s already impressive ability to provide us with a format that proudly displays the Word of God front and center with minimal distractions, I can’t help but think that leaving them out of the bible was an unnecessary sacrifice and weird departure from the 1611 KJV Format they seem to have followed up until this point. Is it a big deal to me? No. But it was at first, and almost prevented me from buying this bible. But then I was reminded to weigh more heavily the objective and purpose of even buying this particular bible in the first place – and it was not to have another study bible, reference bible or commentary, so as to do more research – I have other bibles, books and tools for that. But it was instead to finally own a highly-readable, highly-durable, stunningly beautiful, perfectly accurate and faithfully true: bible. A bible that featured an exterior that evoked enough seriousness to render one curious about the seriousness of the interior. A bible with uncluttered text, whereas I could simply read, study and meditate on the written Word of God with minimal distractions. Lord knows I sometimes have had a tendency to want to pause studying my bible so that I could rush over to my computer and perform a “quick” exegetical word-study on every unfamiliar word I’d come across – perhaps doing without translator footnotes, at least sometimes, would do me some good. Quit relying on men and translators to teach me the bible and instead rely on the Holy Spirit to show me everything I’d ever need to know. (1 Corinthians 2:10-16). So that’s it. This bible is no doubt my favorite. It will no doubt be my main “daily-reader”. And it is one that I am very thankful for having found. 10/10, and nothing really comes close. The Schuyler Canterbury is 1st place: In the medium-large bible category, I’d say the Schuyler Classic (Westminster) Reference Bible is the 2nd best and the Cambridge Concord Bible is the 3rd best. In the small/hand-size category of bibles, I’d recommend the Cambridge Cameo being the 1st best, the Cambridge Pit Minion being the 2nd best and the Cambridge Clarion being the 3rd best (Clarion is 3rd instead of 1st only because I think it’s best to study scripture verse-by-verse. If not for that, then the Clarion is the best KJV on the market, bar none – it is superb.) And yes, I did not include Allan KJV bibles in my rankings even though I think they are a very close 2nd to Schuyler in overall bible craftsmanship – I just cannot in good faith recommend the Oxford Edition of the KJV they have been binding, when Schuyler and Cambridge are still producing tried and tested, error-free Cambridge Editions of the KJV. Hope this has helped somebody out there. Peace and Love be with you always. This bible is a 10 out of 10! From the time you open the box it is a work of art. Flawless construction and wonderful feel. This is the best quality bible on the market. Easily the best purchase I have ever made. My wife ordered me this Bible and it is completely amazing. The black goat skin is awesome. The color shift from gold to red on the page edges is fantastic. This is my very first Bible and I couldn’t be happier. I’m almost afraid to touch it. It’s that nice. The leather is all stitched with a nice gold trim under the seem. This is going to be the perfect family Bible for us. I thank God and our Lord and savior Jesus Christ everyday for showing me the way to his word. Also I wasn’t supposed to get my Bible until Wednesday but the Lord shined his light on me and I got it 2 days earlier Amen. I would recommend this Bible to everyone. May God bless you all. What can I say that hasn’t already been said about this magnificent book? It is just beautiful, in every way possible, crafted with the finest materials and the look and feel is beyond what I had imagined. If you are looking for an heirloom that can be passed down, do not hesitate to buy this. It is worth every penny and more, and I am so glad I chose this one! 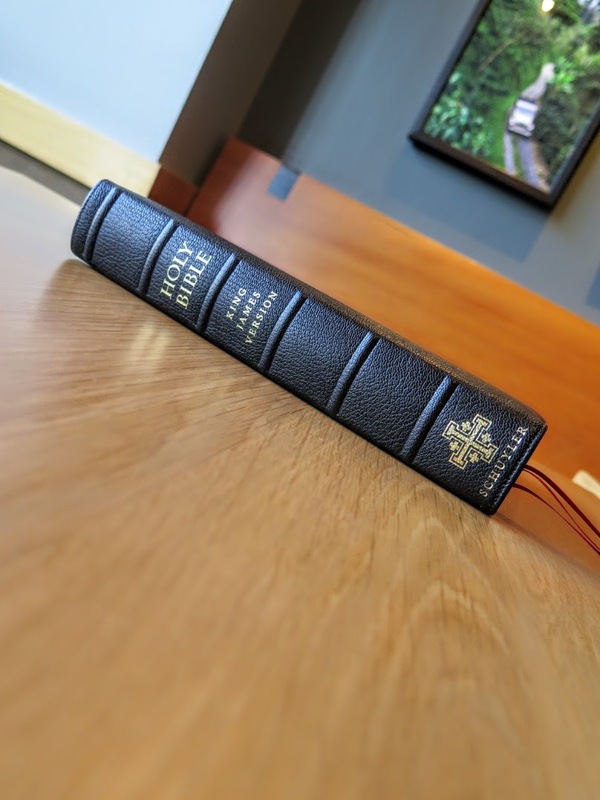 Like so many of the reviews…I love my Goatskin Schuyler Bible! I know many comments say it is difficult to find anything negative to say, but in my case, it is not so difficult. 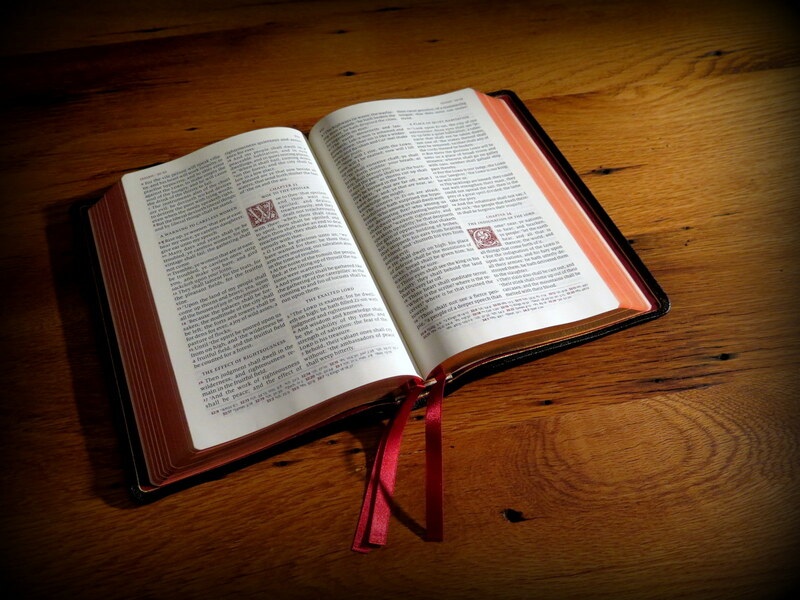 When it it comes to the Bible itself and its craftsmanship, nothing short of excellent! However, the same care and attention to detail is not found in the ribbons. In fact, on many websites and Evangelical Bible, you can see the fraying of the ribbons in many different images. There is also no consistency if they are cut straight or angled. My ribbons starting fraying within weeks of using my Bible. In fact, they got so bad, I removed them all together. Put the same care of workmanship and attention to detail in the ribbons, and hands down…there is no other Bible in the market place that even comes close! I decided to purchase the KJV Canterbury, and I’m very happy I did. At first when I saw photos of this Bible I thought it wasn’t practical. But I wanted a verse by verse high quality, and somewhat larger Bible for study, teaching, and public speaking. After passing this bible by a few times, I decide to download the PDF to see the font, and take a better look. As I looked at the beautiful example page, I thought to myself, “What’s not to like about this bible? It’s gorgeous!” Even the block letters were appealing to me. Schuyler’s designers have chosen a beautiful, and even somewhat contemporary, font for this lovely Bible. The references are at the bottom of each page, so they are not a distraction at all. No more looking to the left or right of the page at references while reading a verse. Each verse number is in red, not black, and believe me, it’s perfect, and so un-distracting. I don’t feel like I’m reading verse by verse, but just straight through with this design. This is, oddly, the most practical Bible I have owned in forty years, and it’s the bible that is easiest for me to read, and stay focused with. I’m discovering new words and concepts in verses I have read for years. I also like the sub-titles that let you know where you are in a story. It’s not over done, and it’s very helpful when looking for places in a story, especially when speaking. This is the easiest reading Bible I own. Not just because of font size, but because of the layout as well. It’s genius. I even love the block letters. They are tastefully done. There’s just something about the layout, it’s calming and easy, and I don’t know how to say it any other way. I got the goatskin in black, with the red leather lining, and yes, it’s beautiful. I’m sure the calfskin versions are gorgeous too. But my surprise with this Bible is that, in spite of being so beautiful, it’s a users Bible, meant to be used every day, and not left on the shelf. That is so important. I think the best Bible is the one that is in your hand! I also own a brown calfskin Cambridge Clarion (NASB), and I love it. With this new Canterbury, I now have two amazing Bibles that I use every day. They serve different purposes for me, but both are practical and easy to read. I have no reservations at all in recommending Schuyler’s KJV Canterbury to anyone who wants a high quality KJV Bible, that will be a Bible they can use every day. I just received my Canterbury Black Goatskin bible today. Got it in four days, ordered on Friday and received it on Monday. Very fast. 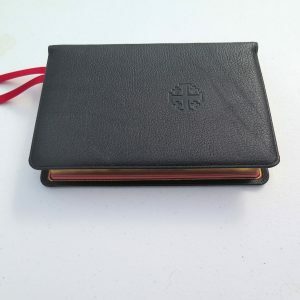 I already have a ESV Quentel in Brown Goatskin, love it, and I got my wife a Quentel NIV in green Calfskin and it is also very nice. I will stipulate that the construction and materials of this beautiful Bible are top notch and there is nothing that I can add to what the previous 41 Reviewers have not already said. And except for the negative comments, I find nothing to disagree with. What I will do is tell you why I chose this Bible over the others available. I have always been disappointed with study bibles. They are so full of content and other distractions (which are helpful and provide some insights) that I do not enjoy just reading the Bible text. So I have given them all away and started looking for text Bibles and I discovered evangelicalbible.com. First I wanted an Allan. They are nice, but I started discovering the different features of the various models. I liked the Long Primers because it looks like they have good concordances and subject indexes that after investigation did not have the completeness that I think I would like to have. The 7C has chapter outlines for each chapter that I know I would love as well as the Cyclopedic Concordance that would be a good in Bible resource, but it had a smaller print that I was not sure I would be able to read it well. Allan has a 53C coming out but it would not have headings in the text as all Long Primers lack and they do not contain the Translator to the Reader that I thought I would like to have. Long story short, I chose the Canterbury. It has headings in the text. It has a very readable text. It has the Translator to the Reader. I could live without the drop caps, but after seeing them in person they are very tasteful, well executed, and just beautiful and they are complimentary to the rest of the text and completes the whole presentation. I will also get a really good Bible Dictionary and a Bible Handbook as well as a commentary to help with studying God’s word and loving it even more that I already do. God bless you in your whole life. Love well. Be gracious. This is the best layout of the KJV text I have ever seen. It makes it so much more readable! The red liner looks great with the black cover. I have Schuyler, Cambridge, and Allan Bibles and this one is the most beautiful of all! Received my Schuyler Canterbury KJV in black goatskin…as usual Schuyler keeps their Quality second to None. What a Great presentation of God’s Word !!!!! Thank You Karen at Evangelical !!!!! This bible is amazing. It’s well crafted and beautiful to look at and read. I primarily read the ESV day-to-day, but have wanted a KJV for awhile now, especially since i’ve been studying church history, creeds, confessions and puritan writings. I’m happy I chose this version and am looking forward to many hours of reading and study.